Sarika Chandra. Dislocalism: The Crisis of Globalization and the Remobilizing of Americanism. Ohio State University Press. 2011. 303pp. In the final section of Capital, Marx makes a striking observation: despite destroying the land-holding peasantry, the birth of manufacturing in England did not wipe out the small, disconnected villages of rural England, but rather refashioned them in capital’s image, as sites of subsidiary resource production, even poorer and more marginal than they had been before (Marx 918). This insight runs counter to what passes for conventional wisdom regarding the cosmopolitan nature of capitalism, that as capitalism expands from town to nation-state to finally engulf the entire world, the vanishing “local” will be brought in line with a uniform worldwide market for labor and goods. It seems Sarika Chandra has a similar kind of counter-intuitive argument in mind with respect to the literature of globalization. Taking on the notion that the “local” is a site of resistance to the inroads of an increasingly “flat” and commodified globe, Chandra argues that the new era of globalization has neither “flattened” the world nor prevented “the local” from emerging as an important site of capital circulation. 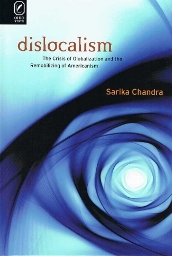 Indeed, as Chandra’s neologism “dislocalism” suggests, globalization has not so much destroyed the local, but rather reproduced it as a new form of capitalist production, consumption, and circulation. While I’m generally suspicious of academic monographs marketing new words as a form of product differentiation (and indeed, one could argue that globalization has increased the pressure on academics to market their ideas like individual Madison Avenue firms), “dislocalism” captures a phenomenon that hitherto we lacked a precise language for. As Chandra reminds us, the connotation of the term globalization is inherently spatial, making it “appear as though the erasure of the local were itself the meaning of ‘globalization’” (Chandra 5). Many critics, from Marxists to free-market liberals have reinforced the spatiality of globalization, including David Harvey’s “spatial fix,” Frederic Jameson’s “cognitive mapping,” Hardt and Negri’s “smooth world,” and Thomas Friedman’s “the world is flat.” In “Jihad vs. McWorld,” Benjamin Barber takes the analysis a step further, suggesting that the local, the traditional, the pre-modern have been the central terms of opposition against this new spatial coordinates of capitalism. What all of these critics have in common of course, is that the “annihilation of space” by new technologies and new discourses have finally brought the world into a single global market, erasing all local particularities with the abstract universal of the commodity form. Whether this is a “race to the bottom” as labor historian Kate Bronfrenbrenner phrased it, or a “global village of freedom” as Tom Peters reassures us, this new form of spatiality is often taken as a given. And yet it is precisely through this drive to displace the local that, paradoxically, Chandra sees the local reemerging as a new form of displacement itself. In an insight reminiscent of Walter Benjamin’s claim that the future arrives in the clothes of the past, Chandra surveys much of the literature of globalization, from business writing and travel writing, from food tourism to the recent academic vogue of immigrant literature, noting the ways in which localist categories of place and nation are used to protect the very boosters of globalization from ravages of the world they created. Beginning with business literature, Chandra demarcates the way in which cheerleaders of globalization, from Tom Peters’ bestselling books such as In Search of Excellence and Management Liberation to the vast and underscrutinized world of MBA Organization Studies (OS), celebrate the arrival of the “global village” while at the same time respond with an instinctive fear of the “denationalized organization” that may very well displace them (44). Management literature as well as OS have in common a “nervousness and anxiety” that they should find themselves “adrift in a global, transnational no man’s land with nothing left to organize or manage” (38). “Creative destruction” is OK, in other words, until it is your job or position of power that is being creatively destroyed. In a move that may surprise humanities scholars accustomed to bemoaning their own irrelevance, literary culture has been the primary means by which business writers such as Peters and Drucker and top business schools such as Tuck and Wharton increasingly shore up their potential loss of power and influence in an multi-polar world. In recent years, business writers and management gurus deploy post-modern theorists such as Deleuze and Guatarri, Derrida, and Foucault to explain the new “more egalitarian” role of corporate culture in managing conflicts and controlling “difference” (45-48). While this may seem like an embrace of the transnational corporation, companies that can experience difference, decentralize, and contain multitudes, it is also a strategy by which management and management theorists attempt to “prevent their own obsolescence” (44). The incorporation and deployment of post-modern theory is part of a larger strategy that Chandra refers to as “management fictions”: management theorists’ use of literary devices as a way to re-narrate their place in an increasingly uncertain world. In a world of fictitious capital, managers and gurus turn to literary theorists and literature itself—teaching MBA students the “classics” as strategies to both articulate as well as contain the sprawling global enterprise of the new transnational corporation. Fiction, particularly US fiction taught in MBA classes and used in management literature, becomes a way to find meaning when national markets and national narratives no longer suffice; the corporation, business students are taught, like the nation, deploys narrative as a way to construct a unified and portable identity. That this literature is often written in the US and disseminated by US universities allows MBA programs to assert the need for US cultural production and management expertise while at the same time disavowing the American roots of corporate expansion. This articulation of the global and national simultaneously is at the heart of Chandra’s project: power becomes “dislocalized,” no longer part of a particular national space, yet not part of a cosmopolitan transnational project either. It’s Americanism as a global identity, and yet without the pesky responsibility to the actual Americans in whose country the corporate HQ still resides. While it may surprise some that management theorists and top business schools incorporate literary theory into their business models, anyone who has taught or taken an undergraduate literature course within the last 15 years cannot miss how much the discourse of globalization has shaped the study of literature. Like the corporate managers, the academic discipline of English is under intense pressure to remain relevant, not only in a world of increased austerity, but also one in which the entire project of national literatures is said to be passé. Chandra thus charges that the field of “immigrant literary studies” is, like the field of management theory, a “dislocalizing” strategy, both displacing the nation-as-space, and yet failing to acknowledge or capture the radical displacement brought by the latest regime of capital accumulation. As Chandra points out, by choosing the immigrant as the new subject of globalization, the narrative of “global” literature still emerges as one negotiating an identity within the culture and boundaries of the United States, rather than imagining that “the conditions of immigration”—including urbanization, cultural estrangement and displacement, a life of motion and movement in search of employment—may be felt globally. Focusing on Julia Alvarez’s How the Garcia Girls Lost their Accents and Diana Abu-Jaber’s Crescent, Chandra examines the way in which both texts present a vision of multiculturalism that ultimately reinforces the notion of the US as an exceptional nation. Indeed, the “border-crossings” that appear to move “under the sign of a….transnational, ethnic borderlands” represents the US as a “diverse place where ethnicities shed their distinct boundaries” making invisible those for whom the “borderlands” “expel, repel, and decimate” long before they even reach the shores of the US (139). Dislocalism concludes with two chapters that are likely more familiar to people as cultural representations of globalization—travel writing and food tourism. In some ways, both genres are at opposite ends of the globalization debate, even if they have arrived at similar places. Travel writing, Chandra reminds us, is a genre that, if we were to take the celebrants of the “global village” seriously, should no longer exist. The entire project of travel writing was, and one could argue continues to be, about bringing the “exotic” home to a domestic audience, to experience both the frisson of the foreign, as well as to make the empire an aesthetic experience. Paul Theroux’s Hotel Honolulu and Robert Kaplan’s The Ends of the Earth both locate the Americanization of the world as their object, and while Kaplan celebrates this and Theroux despairs by staying put in Honolulu, both reinforce the US traveler’s discerning gaze and ability to interpolate the global-surround. In perhaps Chandra’s most cutting critique, she takes on the recent vogue of woman writers who find liberation through travel, citing Mary Morris’ Nothing to Declare as a reification of the United States as safe “domestic” space, presenting the reader with titillating yet sexually dangerous Mexican women and abusive Mexican men. And as a new arrival to the more established field of travel writing, food has emerged as perhaps the most celebrated aspect of globalization, bringing flavors and sensory experiences to a flavor-starved US market: one can travel around the world without leaving Trader Joe’s. As perhaps the most visible marker of globalized tastes, “fusion cuisine” represents the fiction of a “global village” more concretely than any other medium, a kind of multiculturalism on a menu. And yet “fusion cuisine,” like other dislocalist strategies, appeals to a perceived “smooth” US taste, precisely by making it seem as though the US has no indigenous food. As a theoretical work, Dislocalism crucially heightens our awareness to the ways literary culture is mobilized by globalization to foreclose more radical possibilities of spatial freedom. And certainly, it’s an old story—from the workhouses of the early modern period to the carceral mesh of today’s cities, the increasing mobility of capital has often been met with more impenetrable borders, boundaries, and walls for a greater number of people. That the reaffirmation of national borders and national identity is through globalization’s own language thus begs the question of whether “globalization” as such was really as much about “annihilation of space” at all for its architects, so much as an unsettling side-effect of new modes of accumulation. And yet for its theoretical brilliance and astute, insightful readings, much of Dislocalism is a work of literary criticism, explicating ways in which the various works and genres reproduce and further the book’s central concept. While Chandra does make a stab at theorizing the ways in which “fiction” is a containment strategy by management for the ephemeral nature of “fictitious capital,” at times the text seems ambiguous about whether “dislocalism” is merely a posture taken by writers, or an actual modality of accumulation itself. My hunch is that “dislocalism” is more than simply a literary device deployed by the cultural hacks in MBA programs, but is an important way in which global capital actually circulates. US firms are simultaneously global while at the same time highly dependent upon US government largesse and the US military; globalization has not “denationalized” the corporation so much as rewritten the rules by which corporations act in their host nations to the corporation’s’ benefit. US-dominated financial markets have also long used devaluation and debt obligations as a way to weaken some economic blocs to the benefit of their own home industries and financial institutions. In a similar sense, deindustrialized cities such as Detroit, South Bend, and Cleveland have not, as many assume, been simply erased as “local” sites of capital accumulation and have rather been “dislocalised” as new sites of privatization and real estate speculation, hosting toxic industries such as metal recycling, ethanol production, and waste-disposal. While it’s most certainly a sign of Dislocalism’s strength that its concept can be applied to the way in which capitalism actually operates, it would have nonetheless been helpful to the reader if some of the close reading of literary texts also engaged a bit more extensively with the economic realities they are said to represent. Nonetheless, Dislocalism is a vital contribution to the literature of globalization, and should spark many new important conversations about the material culture of our present era. Marx, Karl. Capital Volume 1. London: Penguin Books, 1976. Print. Benjamin Balthaser is an assistant professor of English at Indiana University, South Bend. His scholarship, teaching, and creative work investigates the relationships among social movements, racial identity, and cultural production. His current manuscript entitled Modernism and Anti-Imperialism: Global Movements and Radical Culture from the Great Depression to the Cold War is an exploration of the connections between cross-border, anti-imperialist movements and the making of modernist culture at mid-century. Balthaser’s critical and creative work has appeared or is forthcoming in journals such as American Quarterly, The Oxford History of the Novel in English, Reconstruction, Minnesota Review and elsewhere. He also recently published a collection of poems about Jewish victims of the blacklist entitled Dedication, that appeared from Partisan Press in the fall of 2011.